Lasers are not by any means ubiquitous in dentists’ offices in the US, but their acceptance is growing in the States and beyond as they become more refined, as new applications are found, and as training and experience with the devices grow. Lasers began to gain acceptance among dentists in the early 1990s as a possible way to improve surgery on soft tissues, such as the gums, or gingiva. Within 10 years, laser systems were being designed to handle harder, denser material, such as the bone that comprises the mandible and the rest of the jaw. Dentists increasingly are turning to lasers to find and treat periodontic and endodontic diseases, and to set bonding materials, as seen here. Now, lasers are used to cure (set) fillings and other restorative materials, to remove dental caries (areas of decay) and tooth parts so as to eliminate disease or prepare areas for restorative work, and to enhance tooth-whitening procedures (see the sidebar below). Laser dentistry reduces the need for anesthesia during surgery and for stitches afterward, and bleeding and infections also are diminished. Importantly, patients experience less pain and discomfort during and after a laser procedure than they do with traditional methods. Much of conventional dentistry is mechanical. Drills, picks and scrapers are the standard tools of the trade. Compared with laser systems, they are far less expensive, but lasers can benefit patients by desensitizing the work site and aiding regeneration of damaged tissue. For dentists, lasers help by reducing the time needed for most operations and by decreasing the risk of infections. 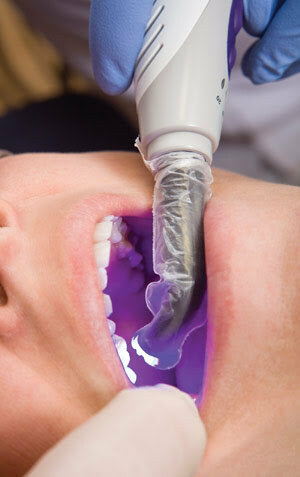 A dental laser can be used to remove gingival (gum) tissue to improve a smile. Top left: preoperation. Bottom left: the immediate postoperative view with bleeding under control – unlike a scalpel, which would cause more bleeding, the laser also disinfects the surgical site. Right: two weeks after the operation, showing good healing. Courtesy of Don Coluzzi. Where a scalpel might accidentally introduce bacteria to a cut – or spread germs through an incision – a properly used laser will kill bacteria as the beam moves along its path, said Sebastiano Andreana of State University of New York at Buffalo. Lasers help reduce bacteria counts in affected tissue and, thus, are excellent for preparing soft and hard tissues for other procedures, such as gum shaping, adding fillings or inserts, and adding, changing or removing braces and other orthodontic equipment. Left: Prior to laser periodontal surgery, these gums were swollen, sore and prone to bleeding. Right: After the laser procedure, the gums are pink and healthy again. © Andrew Weber, DMD. Lasers have been slow to penetrate the dental market, however, because the cost of a robust dedicated system is 50 to 100 times more than that of a basic drill – and that’s before training costs. Despite patients’ aversion to the sound, vibration and other sensations induced by the drill, not all dentists have yet deemed the extra cost worthwhile. Andreana said that, under certain conditions, lasers help increase the bond strength of restorations and similar materials by increasing the roughness of the tooth area. A coarser site permits more adhesive contact and, therefore, a surer attachment. Some manufacturers are pushing the laser beam through a water stream, reducing the amount of heat delivered during high-power operations, such as tooth drilling and bone cutting. Research into potential new applications for dental lasers is primarily supported by commercial operations looking to fill new niches. It also is supported by federal funding in the US, even as the FDA slowly approves new technologies and applications. Coluzzi said that another new application to watch is “photoactivated disinfection.” Instead of just using a laser to clean out the area of a beam spot, a larger area can be covered with a photosensitizer that reacts to a specific wavelength. The beam can then quickly activate the disinfection process over a wide area. Nd:YAG and CO2 lasers were the first to market, but diode lasers are most commonly used now because of their more compact size and less demanding power requirements. Argon-ion lasers typically are used for curing and bleaching procedures, whereas Er:YAG types are used for cavity repair and other operations on soft and hard tissues. Er:YAG lasers can be used to treat carious lesions without injected anesthesia. Left: preoperation. Center: the completed removal of the cavity. Right: the final tooth-colored, filling. Courtesy of Don Coluzzi. Er:YAG and CO2 lasers are better for cutting tissue because they emit wavelengths that find the water in the target most efficiently, Coluzzi said. Besides cavity repair, Er:YAG lasers have been applied to less well studied applications, including as a means of breaking the bond between a tooth and a previously installed porcelain veneer. Peter Rechmann and his colleagues, also at UCSF, found that a 2.94-µm Er:YAG laser emitting at 133 µJ/cm2 could safely debond veneers from tooth enamel within about 2 minutes. This combination of wavelength and power allowed the beam to pass through the veneer and ablate the cement used in the initial veneer application. The tooth left behind had no damage to its enamel. Over the past several years, however, diode lasers have virtually taken over. High-power applications still require CO2 or erbium models, but making laser systems that have the small-footprint, high-flexibility, low-cost features that are attractive to dentists is paramount. 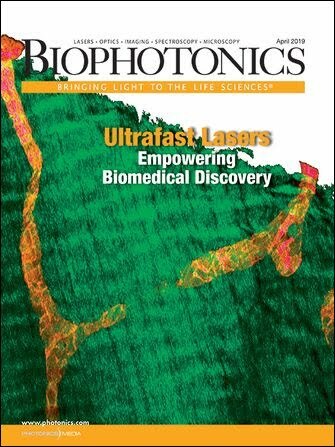 The dominance of diode lasers “hasn’t changed that much in the last five years,” said Daniel Fried of UCSF, who remains a big fan of CO2. Besides high-intensity operations such as ablation of hard tissues, CO2 holds promise for caries prevention. Though not cleared by the FDA yet, Fried said, this type of laser can be used to heat the tooth’s enamel – the hard, calcified material on the outside of the tooth. This action changes the properties of the mineral, making it less prone to bacterial attack, similar to the way fluoride alters enamel. “The science is out there for CO2,” Fried argues. It’s just a matter of getting more companies interested and obtaining more funding for proper trials. CO2 lasers require waveguides, not fibers, to deliver a beam, but Fried said there is no reason a compact system could not be built. The wavelength range of 638 to 655 nm is used to induce fluorescence in hard tissues, which are mainly composed of calcium phosphate, helping to differentiate between healthy sections and caries. The same laser emission range is useful for finding subgingival calculus – the hardened crystals, also known as tartar, that form beneath the gums, and thus is impossible to spot with the naked eye. When excited by a 635-nm beam, for example, subgingival calculus fluoresces at a peak of 700 nm, simplifying removal. What is tough, Andreana said, is proving efficacy to practicing dentists. 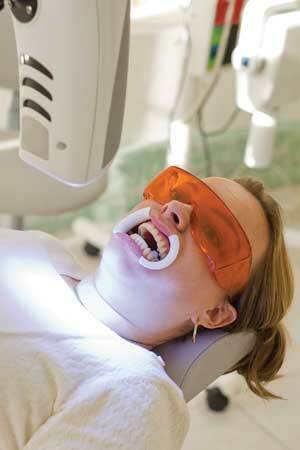 Only a small fraction of dentists in the US use any type of laser in their practice. Coluzzi estimates that the figure is between 10 and 20 percent. Dentists are looking for evidence-based results, which are just trickling in, and which aren’t always good news. Last year, the American Academy of Periodontology argued in the Journal of Periodontology that lasers come up short – or are only as good as standard mechanical methods – at sulcular debridement, at reducing subgingival bacterial levels, or at scaling and root planing. “There is a lack of large studies in dental-specific journals,” Andreana said. Instead, most papers on laser-related dental applications appear in laser- or physics-focused journals or as nonpeer-reviewed letters and short pieces shared between aficionados. Nonetheless, the number of peer-reviewed papers in journals trusted by dental professionals has increased dramatically in the past 10 years, and more are expected over the next several years. Where laser-based therapeutics may struggle to gain a foothold in dentists’ hearts, imaging is another matter. Some patients, already familiar with techniques such as optical coherence tomography because their ophthalmologists use it to check retinal health, have piqued the interest of their dentists. 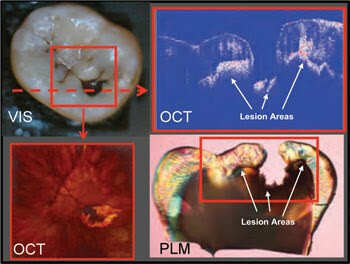 Optical coherence tomography can be used to monitor the spread of lesions under tooth enamel. Courtesy of Daniel Fried. OCT is particularly useful for gaining a cross-sectional view of tissues, which helps with the identification of lesions and of the boundaries between carious and healthy tissues. OCT also allows a dentist to quickly determine whether a lesion is active or arrested, which a visual examination cannot do, Fried said. Lesions can be hidden under the dentin and spread out laterally, for example. OCT is superior to x-ray imaging for characterizing lesions in this situation. “OCT is good for nondestructive research into caries development,” he said. Nonetheless, he added, near-IR imaging is gaining acceptance because OCT remains expensive. Enamel is slightly transparent in the near-IR, so you can shine a light through the material to seek out lesions. Whether used indirectly to find and characterize diseased teeth and gums, or directly to treat patients and keep them more comfortable than mechanical picks, drills and scrapers do, dental lasers are on a trajectory to future prominence. 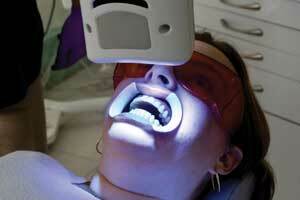 Teeth whitening is all the rage, but do lasers help or hurt? And who is qualified to perform this procedure? Having bright white teeth is not a new phenomenon sought out exclusively by Hollywood stars and vainglorious members of society circles. No, tooth whitening is a centuries old pursuit that is promoted today not only by average people looking to improve their attractiveness or self-esteem, but also by their dentists and dental hygienists. Whitening one’s teeth didn’t get a serious scientific perusal until the Victorian era, when bleaching was the preferred method of spiffing up the errant tooth that had lost its vitality, yet remained unpulled. Putting the shine to healthy (vital) teeth did not start in earnest until 100 years later, in 1989, with the introduction of a take-home kit consisting of a 10 percent solution of carbamide peroxide, held to all of the teeth at once, inside a plastic tray. Light-assisted teeth whitening has gained in popularity over the past 10 years. Staining, and therefore whitening, occurs not at the surface of the tooth’s enamel, which is semitransparent, but at the next level down – the dentin. The surface of the dentin can naturally have specks of color – often yellow, but also black, gray and brown. The dentin also can be affected by substances people put in their mouths, such as wine or tobacco, which seep through pores in the enamel. Whitening typically is achieved by dousing teeth in the aforementioned carbamide peroxide or in hydrogen peroxide of varying concentrations. Patients given kits to use at home, for example, typically use gels with 10 percent carbamide peroxide, held in the mouth for up to an hour. In-office treatments can involve materials with as much as 35 percent concentration, which are held in the mouth for up to an hour at a time; this procedure is performed over several office visits. In the past few years, some practitioners have added heat- and light-based treatments as an adjunct to either peroxide treatment. Patients undergoing light-assisted teeth whitening must be aware of the possible risk of increased tooth sensitivity after the procedure. Adding light to the bleaching procedure started about a decade ago and is steadily becoming more popular. Some systems sold use one or more 810-nm diode lasers to enhance oxidation during bleaching; others use ultraviolet light delivered via high-intensity discharge lamps. Whatever the wavelength or power range, the light source typically is used with a higher concentration of peroxide – as high as 35 percent. Light-enhanced bleaching and laser-activated bleaches both exist. For example, Discus Dental of Culver City, Calif. – now owned by Netherlands-based Royal Philips Electronics – offers the BriteSmile and Zoom 2 systems; LumiLite, the LumaArch system; and Den-Mat, the Sapphire PAC Light. Commercial systems using either lasers or LEDs can be found. It is yet unknown what the mechanism of action is for either peroxide, but people who advocate the addition of a light source believe that the energy increases the release of oxygen from the peroxide, thereby accelerating the release of free radicals that tear down more of the culprit materials behind the stain. No matter how light is thought to work, whether light from either LEDs or lasers is used remains controversial. While some studies have shown that adding light improves results gained with high-concentration peroxide treatment, others show no benefit. Some studies have shown that lasers can speed up the whitening process in a session, yet the overall whitening effect diminishes more rapidly afterward. Another concern is whether excessive laser fluence could raise the temperature of the tooth pulp, thus damaging it. In addition to protective eyewear, patients are given various devices to protect their gums and other soft tissues from direct and scattered light. From “In-office Vital Bleaching with Adjunct Light,” Dent Clin N Am 55 (2011), pp. 241-253. Courtesy of Joe C. Ontiveros, University of Texas Health Center at Houston. © Elsevier Inc.
Because the field is still relatively new, there have been few large controlled studies, and those that have taken place have produced wildly varying results. For example, during the past year, separate studies published in Lasers in Medical Science and Operative Dentistry found, respectively, that lasers reduced and heightened tooth sensitivity in patients. Less equivocally, a report two years ago in Photochemical & Photobiological Sciences by Ellen Bruzell of the Nordic Institute of Dental Materials and her colleagues showed that UV-based light sources do not aid bleaching, but do increase the health risks to one’s skin and eyes. Who can whiten your teeth? You may have a choice of technologies when getting your teeth sparkling white, but you may not have much choice where you have the procedure performed. Teeth whitening can be accomplished by chemicals with or without an additional light source, but regulators say that anything stronger than low-concentration peroxides offered in take-home kits and over-the-counter products must be performed by licensed professionals within a dental practice. In 2009, for example, the Alabama courts ruled that clinics offering light-enhanced whitening services were in fact practicing dentistry without a license, despite the claim that the service was “cosmetic” as defined by the FDA. In 2010, however, after the North Carolina State Board of Dental Examiners informed more than 40 tooth-whitening providers that they were performing the duties relegated to dentists solely, the Federal Trade Commission intervened, saying that the board was interfering with fair trade, thus breaking federal law. North Carolina insists that it is trying to protect the public, however, and it is battling the FTC over whether teeth whitening should be considered an absolute form of dentistry. The American and British Dental Associations both support the proposition that teeth whitening should be performed only by licensed dental practices. In the UK, the ruling General Dental Council stoutly supports laws stipulating dentists-only policies; in the US, however, legal opinions are more mixed. State-level dental boards in North Carolina and Connecticut have sided with dentists over whitening services. A judge has ruled against the New Jersey Dental Association in its attempts to constrain whitening services to licensed dental practices. More studies are needed to show whether or not light-activated or light-enhanced teeth whitening is beneficial – and not harmful – to patients, but it seems that there will be a market for them for years to come.